An amazing feat of engineering might not look so impressive at first glance; but sometimes, below the surface, astounding things are happening — especially if it saves a species from certain oblivion. 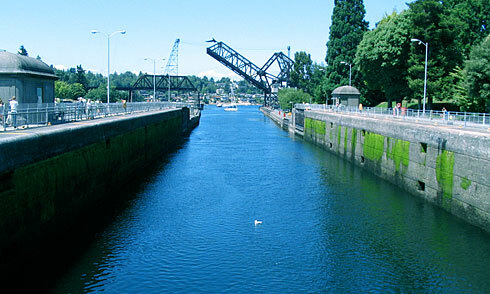 My explorations of the Emerald City brought me to an excellent example of this: the famous Hiram M. Chittenden Locks. It was the 57th day of my life-changing journey to the West Coast of the US and back, and this was probably the first amazing piece of engineering that I explored that didn’t actually tower over me. Instead, it worked beneath my feet, allowing ships to pass from the Puget Sound to Lake Washington and back again. That, in itself, wasn’t especially surprising. What surprised me were the giant horns. 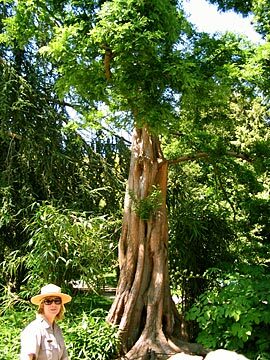 First of all, to get to the locks I had to pass through the Carl English Jr. Botanical Garden, a world renowned garden that contains over 500 plant species, not to mention some quite otherworldly trees. After passing through the garden, I finally saw one of the busiest lock systems in the country as it stretched across the Salmon Bay. It was quite a sight to behold, and I stood there a while, watching a ship descend slowly as it reached the water level of the Puget Sound. Then the gates opened, and it headed out, possibly to the ocean itself. 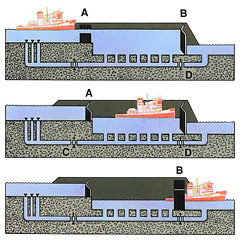 Maintain the water level of the freshwater side of the lock (which is kept 20-22 ft. above sea level). To prevent the Puget Sound’s salt water from mixing with the freshwater lakes. To allow boats to travel between the freshwater lakes and the Puget Sound (which have a water level difference of at least 20 ft. as stated above). There’s a big lock and a smaller lock, and the locks work by creating a containment area that is able to change water level while a boat is within it. The diagram to the side of this text should you a better idea of how it works. In a way, the two locks are like two big bathtubs for boats, except that instead of washing the boats, they change the boat’s elevation. On my way in, I’d noticed a sign that said guided tours were given periodically, so I began heading back to the Visitor Center to catch one. I returned to find rows of chairs in a smallish room. I sat down, and a woman explained to us some of the history of the locks and botanical gardens. The most memorable part of this introduction was how humans had changed the area in a profound way. Two illustrations were presented, one showing how the Seattle area appeared in 1902 (before most of the development), and one showing how it appeared today. The difference was rather shocking. Humans had straightened rivers, changed the size of the bay, and done a lot of other things that probably aren’t even obvious from the illustrations. To show the scale of these changes and give you a better idea of how the area has changed, I’ve taken a good deal of time to create an animation that alternates between the two illustrations every three seconds. Isn’t it better now? Not nearly as many pesky wetlands… and more buildings now, too! Yay. Can you hear my sarcasm? The tour continued outside where we learned more about the botanical gardens around the locks. Probably the most memorable part of this tour was the discussion around a beautiful (and very old) tree which looked African in origin. About a dozen of us surrounded the tree while the tour guide explained some of its story. Apparently the seeds to this tree were donated to the garden, and its species was very rare. It was a stunningly beautiful tree, and I’ve never seen one like it since. When the tour reached the locks, the tour guide pointed out something that was in plain view that I hadn’t noticed before. In the distance, near the edge of the Salmon Bay was a small pile of boats and a big pile of boat debris. Apparently, it was the boat junkyard. After all, what better place to throw your old boats than by a waterway that leads to the ocean? In all fairness though, the boats didn’t look like they’d been there for long, and it’s quite possible that it was a temporary place to put damaged boats. At last the tour began crossing the lock. We had to wait a bit for a ship to complete its passage, and I was slightly amused that a stoplight, not unlike one you would see on the street, flashed green and red depending on the status of the lock. Once we’d crossed the lock and the spillway dam, we stopped at the fish ladder to see it from above. The fish ladder is kind of like what you’d expect, except instead of rungs there are small “steps” that the fish can pass through. So why did people build this fish ladder? Did the salmon benefit from this? The fish ladder was built because it’s absolutely essential that anadromous fish (like salmon) are able to pass from the salt water of the Puget Sound to the fresh water of the Salmon Bay within their lifetime. Salmon live their lives in salt water, but return to freshwater to lay their eggs, so without the ability to cross between those two worlds at will, all of the salmon in the area would die. And naturally, their disappearance would have horrible, cascading effects on the surrounding ecosystem. And we certainly don’t want that. Normally, fish ladders are located entirely within freshwater, but when the US Army Corps of Engineers originally built the locks in 1917, all of the salmon runs out of the Cedar River watershed were blocked. The fish ladder solves this problem, and this one in particular was quite unique in being one of the few fish ladders located where salt water and fresh water meet. However, there may be even more to the fish ladder than that. 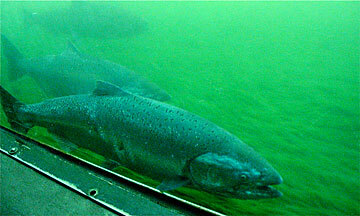 Perhaps the fish ladder is making the salmon stronger… perhaps even giving them special powers. 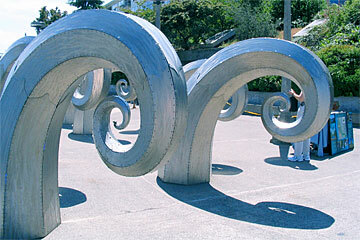 How else can you explain the strange twisting horns springing up out of the concrete near the fish ladder? The tour ended in the lower levels of the fish ladder. Steps led down into a space that reminded me more of a dimly lit concrete bunker than a tourist attraction. Still, the walls had windows that allowed you to look in at the fish ladders to see the fish in action. And watching them was surprisingly entertaining. As the tour officially came to a close, everyone dispersed. And I was left standing there, staring at a lone salmon as it held pace with the current around it, wondering how long it would take for the salmon to conquer the challenge of reaching its breeding ground. Did the salmon ladder make its job harder? I don’t know. But some part of me held a bit of nostalgia for the days when these waterways regulated themselves without human intervention. I highly recommend you checkout the Chittenden Locks (also known as the Ballard Locks) and Botanical Gardens while you’re in Seattle. Metaphorically and literally, it’s where wildlife and engineering meet, and visiting it was one of my favorite experiences in Seattle. And please, catch a free walking tour at the Visitors Center. They’re a lot more fun than going it alone, and I learned a heck of a lot more from the tour guide than I would have just walking around alone. Views of the Space Needle are coming up! It’s such a beautiful piece of architecture. Be sure to subscribe now so you don’t miss it. Edit: The Space Needle photos have been released. Photos from this event are in the Chittenden Locks album. All photos in the Byteful Gallery are under a Creative Commons license. With so much free content on Byteful Travel, why not tell a friend? 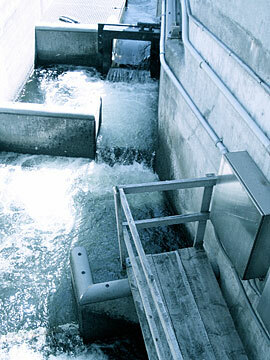 I knew about salmon ladders before, in Sweden hydro dams have them. Very interesting to see the photo and all the background as well though. The difference in the natural landscape in Seattle was really astounding. And that’s a pretty young city. I wonder what place like Paris or London actually looked like before major habitation? Good question, Jack! I’d expect their waterways were changed significantly by humans, as well. 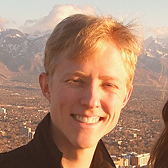 Typically when a natural area is settled, waterways are modified for shipping purposes, and Seattle is an extreme example of this. Thankfully, smart people invent things like fish ladders to keep the local species around. 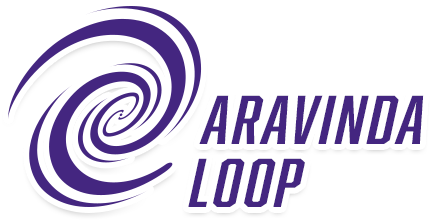 Thanks for stopping by and leaving feedback! It reminds me why I do what I do. Thank you for the detailed description and pictures. Loved it. I can add, “not always for good…” Man should be more sensible to nature. Have you seen National Geographic’s “Life After People”? Nature will recover. loved the article really you wrote it so nice it made me want to go there myself! thanks a lot ! thanks for the where is marco game! I’m very glad you both enjoyed the article. It was quite a place! Dido, were you able to find Marco in all the photos? I know it can be tricky but you’ve got to remember he’s hiding in the white areas…unless he’s cloaked, in which case the photo will say so. Hey Andrew.. the truth is, I loved the game idea but didn’t have the chance really to check it out. promise to do so this weekend!